In the land of ‘Makke di roti and Sarson da Saag,’ countless footfalls in a food court where besides being refreshing, quite indicative of change that has come to the so-called backwaters of Punjab. 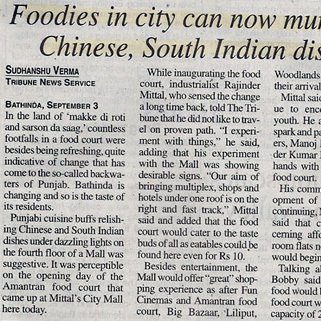 Bathinda is changing and so is the taste of its residents. Punjabi cuisine buffs relishing Chinese and South Indian dishes under dazzling lights on the fourth floor of a Mall was suggestive. It was perceptible on the opening day of the Amantran food court that came up at Mittal’s City Mall here today. While inaugurating the food court, industrialist Rajinder Mittal, who sensed the change a long time back, told The Tribune that he did not like to travel on a proven path. ” I experiment with things,” he said, adding that his experiment with the Mall was showing desirable signs. “Our aim of bringing multiplex, shops, and hotels under one roof is on the right and fast track,” Mittal said and added that the food court would cater to the taste buds of all as eatables could be found here even for ₹ 10.